Today, I would like to showcase some of the cool things that one can do with the Qubes networking infrastructure, specifically with all the new features that have been brought by the just released Qubes Beta 2. This will cover the use of multiple Net VMs for creating isolated networks, the use of a Proxy VM for creating a transparent Tor Proxy VM, as well as demonstration of how to use a Standalone VM with manually assigned devices, to create a “WiFi pen-testing” VM, which surely represents the “for fun” aspect of this post. Net VMs, that have networking devices assigned to them, such as e.g. a WiFi or Ethernet card. Each Net VM contains a Xen network backend that is used to provide networking to all VMs that are connected to this Net VM. Regular VMs (AppVMs) that use the networking provided by Net VMs (so they have Xen network frontends that provide virtual interfaces that are backed by the backend in the corresponding Net VM. Proxy VMs that combine both of the above: to Net VMs they look like regular AppVMs, because they are consumers of the networking they provide, but to other AppVMs they act as if they were Net VMs themselves, allowing other VMs to connect to them. Of course the Proxy VMs do not have directly assigned networking devices – they use the networking provided by the Net VM that they connect to. One can chain many Proxy VMs, as we will see below. The virtual interfaces in client VMs are called ethX, and are provided by the xen_netfront kernel module, and the corresponding interfaces in the Net/Proxy VM are called vifX.Y and are created by the xen_netback module. Each Net and Proxy VM implements NAT, specifically masquerading, for all the connected VMs. Additionally to this SNAT, each Net or Proxy VM provides also DNAT redirection for DNS resolutions, so that each VM behind a Proxy or Net VM thinks that it uses a DNS in the Net/Proxy VM, but in fact all the DNS request are DNAT-ed by all the Proxy and Net VMs down the original DNS that is provided to the final Net VM. This smart trick allows us to avoid running a DNS caching server in Proxy/Net VMs. Also, any VM-to-VM traffic, among the VMs connected to the same Net/Proxy VM is blocked by default. Additionally, each Proxy VM enforces system-wide firewaling rules, specifically the rules for all the directly connected VMs. Those firewalling rules are centrally managed in Dom0 and exposed to each Proxy VM through Xen store. One useful application of this firewalling mechanism is to limit certain VMs to only specific type of white-listed traffic to minimize likelihood of user mistakes. A good example could be a work VM that might be limited to network connectivity only with the select corporate servers and denied all other traffic. This way, when the user receives an email message with an embedded http link (possibly leading to a malicious website) and accidentally clicks on it, nothing wrong happens. The current infrastructure doesn't support IPv6 routing, but we will likely add this support in the upcoming Beta 3. The default network configuration in Qubes. So, by default there is one Net VM, called 'netvm', that is automatically assigned all the networking devices in the system. 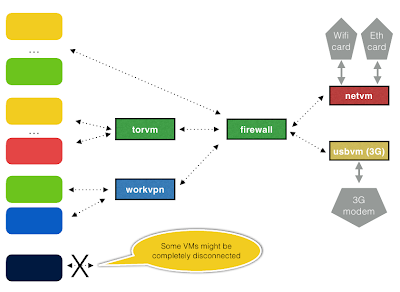 There is also one Proxy VM, called 'firewallvm' that is directly connected to the default Net VM, and which provides networking to all other VMs in the system. This Proxy VM is used for firewall rules enforcement. Each such service VM consumes 200MB of RAM by default. For example I have a 'vault' VM that I use for keeping my master PGP keys, and other secrets, and this machine is not connected to any network. In some scenarios the machine might be connected to two or more physically separate networks (e.g. safe corporate intranet, reachable via ethernet cable on the user's desk, and the unsafe and evil Internet, reachable via WiFi card). A simple setup with two isolated networks, and one fully isolated domain ('vault'). This configuration provides very strong isolation between the VMs belonging to network #1, and the VMs belonging to network #2. Specifically, this becomes significant if we fear about potential remotely exploitable bugs in the client code of the core TCP/IP stack (in this case the Net VM could potentially compromise all the connected VMs -- but the same problem applies to even physically separated machines that use the same network). 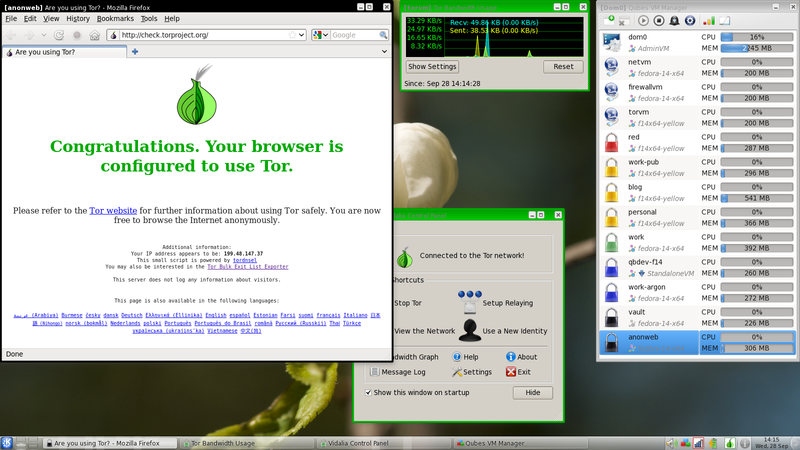 The 'torvm' Proxy VM provides anonymized networking to 'anon-web' and 'anon-bitcoin' VMs. All the traffic generated by the VMs behind 'torvm' is either fed into the Tor network, or discarded. Furthermore, any app running in those VMs is not able to read any global system identifiers, such as the external IP, external MAC address, etc. Our Tor proxy would forward only the Tor traffic, so we don't have to fear about some Tor-not-aware applications, or even intentionally malicious ones to compromise the privacy of our connection. This is because such applications have no way to generate traffic to the outside world without going through our Tor proxy (unless they could exploit a hypothetical vulnerability in the Tor process running in the Tor VM). Also, the applications running in any VM behind the Tor proxy are not able to determine any globally identifiable IDs, such as the user's external IP address, the real MAC address used by real NICs, etc. Interestingly just after writing the above paragraph, I discovered that one of our xenstore keys had wrong permissions and, as a result, any VM could read it and get to know the actual external IP (the key is used by a Net VM to communicate the external IP configuration to the connected Proxy VMs, so they could know when to update the firewall configuration). The fix for this problem is here, and the update (qubes-core-dom0-1.6.32) is now available for Dom0 (just do qvm-dom0-update to get it installed). So, this represents a rather strong setup for use with Tor. Let's now have a look at how to practically create such a configuration, step by step. Alternatively, if we didn't trust the Tor client rpm package to be non-malicious, specifically for its installation scripts to be non malicious, we could have based this on a different template, e.g. one used for less trusted VMs, or we could installed the Tor client in /usr/local, that is backed by the VM's private storage, but this would require compiling Tor from sources. And then power off the template VM. Now, every VM based on this template, started after the template shutdown, will also see the Tor binary in its filesystem. echo "Error getting QUBES IP!" echo "Not starting Tor, but setting the traffic redirection anyway to prevent leaks." || echo "Error starting Tor!" Except for the “QUBES_IP=$(xenstore-read qubes_ip)” line that reads the torvm's IP address, there is nothing Qubes-specific in the above listing. It's just a standard way of setting up transparent Tor proxy. It is important that this file be located in the /rw directory, as this directory is backed by the VM's private storage and will survive VM reboots. The VM's root file-system is read-only and all the changes to it are lost on VM shutdown (VM gets an illusion of the root fs being writeable thanks to Copy-On-Write mechanism, but the actual COW backing device is cleared upon each VM shutdown). From now on, every time you start the torvm (or when Qubes starts it in response to start of some other VM that uses torvm as its Net VM), the Tor transparent proxy should be automatically started. Now, every time you start the anon-web VM (e.g. by clicking on the Web browser icon in the anon-web's start menu), Qubes will also ensure that torvm is up and running, and this in turn would configure all the Tor proxying for this VM. We should however make sure to disable "Start the Tor software when vidalia starts" option in Settings/General in Vidalia. Otherwise, Vidalia might kill your original Tor (that has transparent proxy open) and start own without transparent proxy enabled. The web browser runs in the 'anon-web' VM that uses 'torvm' for networking access, and thus all the traffic generated by 'anon-web' is routed through the Tor network, or discarded if it's a different traffic than TCP or DNS. Of course one case easily create more VMs that would be using torvm as their Net VM, as so would have anonymized network access. The beauty of this solution is that in case one of my anonymized VM gets compromised, others do not. Plus, the already mentioned benefit, that no matter whether apps in those VMs are buggy, or even intentionally malicious, they would not be able to leak out the user's external IP address. Because we would like to use all sorts of l33t h4x0r t00lz pen-testing security software in this VM, it would make sense to create it as a Standalone VM, which means that it would get its own copy of the whole file-system (as opposed to just the home directory, /rw and /usr/local, as it is the case with regular Qubes VMs). This would ease the installation of all the extra software we would need there, and also ensure that even if the install/build scripts were malicious, the damages would be contained only to this very VM and nothing else. Also, for some reason the standard Linux WiFi stack and drivers still don't support injection on (all?) most of the WiFi cards out of the box, so we would need to patch the actual kernel drivers -- yet another reason to use a Standalone VM in this case. You can easily find the BDF address of any device using the lspci command in Dom0 -- this would be something like e.g. “02:00.0”. 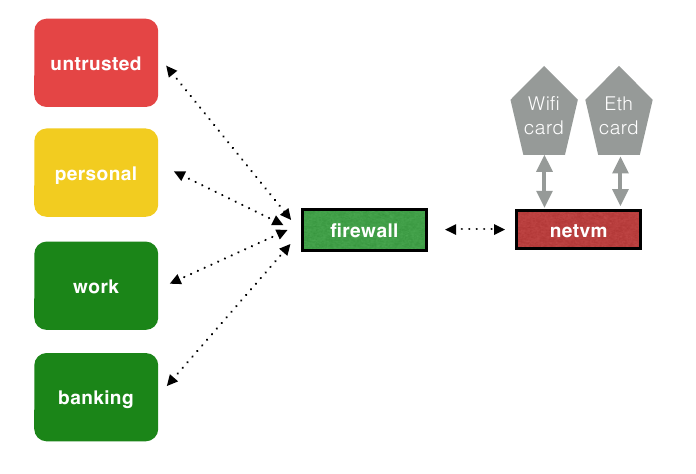 You should make sure that this WiFi card is not used by any other VM, specifically by your default Net VM (called 'netvm' in a standard Qubes installation). Ideally you could just use a dedicated Express Card-based WiFi card, leaving the built in WiFi assigned to your default Net VM. Because it's a Standalone VM, Qubes will make a copy of the whole root filesystem, and thus it would eat about 5GB of your disk (normal VMs would take only as much space as their private fs takes up). ... and then install the prerequisite software there, starting with downloading the reasonably new compat-wireless sources, together with the required injection patches, and then building and installing the new kernel modules. All actions below are now executed within the VM. This stuff here is really nothing Qubes- or Xen-specific -- one would do more or less the same on any Linux in order to get injection working (so, treat this as a free bonus WiFi hacking tutorial on Linux). Note that you don't need to add any explicit masquerading rules, as they are applied by default on Qubes VMs (you can take a look at the nat table in the VM if you want to see by yourself). (you can also add an udev rule to that automatically). Please note that as your wififun VM is a regular Qubes VM, it is automatically connected to the default Net VM, which in turn provides networking to it. That's why it is so easy to create a fully functioning fake AP. Catch #1: When you start a driver domain late after system boot, so after some days of uptime and extensive use of VMs, Xen might not be able to allocate enough continues (in terms of MFNs) memory for a driver domain. And PV driver domains, unlike normal domains or HVM driver domains, do require MFN-continuous memory for their DMA buffers (HVM domains do not need that, because IOMMU can create an illusion of this; even though IOMMU is also used for PV driver domains, for protection, it doesn't actively translate bus addresses into GMFNs). and then starting the driver domain should be fine. Now we can start all other domains, and that should no longer be problematic for the already running driver domain. [dom0]$ qvm-prefs wififun -s kernelopts "swiotlb=force"
And rebuild the compat-wireless, unload, install modules, and then load drivers again. As you can see, Qubes Beta 2 now offers a very advanced networking infrastructure that allows more advanced users to create very sophisticated configurations, allowing for pretty good isolation between various domains and networks. Qubes leaves it up to the user (or admin) to figure out what would be the best configuration -- most users would be happy with the default simple setup with just one Net VM and one Firewall VM, while others would go for much more advanced setups. A bit more advanced networking setup. The usbvm has a 3G modem assigned, and it is possible to dynamically switch between the Net VMs without restarting any other VMs. I'm impressed by how easy it looks! More of a Tor question but can 1 physical PC run multiple concurrent secure channels? e.g. So that I can have one VM + tor channel for hacking the Pentagon and a different pair for posting to my anonymous blog. Presumably in your setup this would require multiple tor VMs? 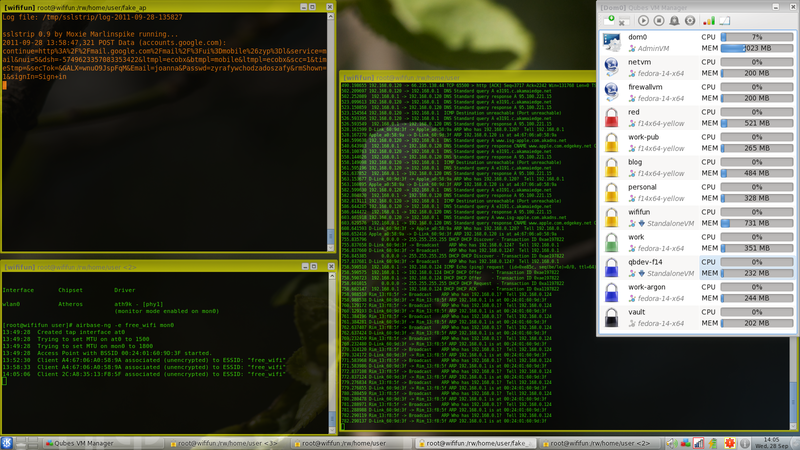 Also, does Qubes work in a multi user fashion i.e. on my home PC for myself + kids? Qubes is what any OS that claims to be "secure" should be like. I would not be surprised at all if the Qubes model becomes the defacto standard in all operative systems in the future. @idler: 1) if you trust Tor, then one Tor VM should be enough (you can just use multiple VMs connected to the Tor VM). 2) No, Qubes is a single user system. Impressive, that is one thing I always missed in an OS - using different networks (interfaces) for different apps (in your case VM's)! QubesOS now should be multi-user aware. But that's kinda wining on a high level. I hope that QubesOS will in near future support Windows as you mentioned in an older post, then it would be my ultimate OS of choice... Okay, since I compose music at least one machine will run MacOS X then. Thank you for this awesome OS. I would like to ask if there will be possible to run normal VMs, beside AppVMs in Qubes and install standard operating systems in those VMs. For example If I will need to do some work on Debian, so I will dont need reboot computer (and running other OS on bare metal is not a good thing, beacuse it will not be as secure, as having only Qubes installed). Also it will allow to use simulatenously apps in Qubes AppVMs, and other operating system. Will such feature be supported by Qubes OS? @johnxyz: support for "normal" VMs is planned after Qubes 1.0, sometime in the first half of 2012. Wow, just came across Qubes today. I'm going to give it a go tonight. Thanks for sharing your awesome work. Is there different permissions in qubes 3 for the /rw/config/ directory? I can't seem to write any of the scripts to it without sudo, but then even when I set them to executable they do not start with the vm.